Citizen scientists Gerald Eichstädt and Seán Doran processed this image of Jupiter's Great Red Spot using data gathered by NASA's Juno spacecraft on April 1, 2018. A new photo by NASA's Juno spacecraft captures Jupiter's famous Great Red Spot in all its angry, swirling glory. The new image is a composite of three photos Juno took with its JunoCam instrument on April 1, during the probe's latest close flyby of the solar system's largest planet. Juno's altitude above the cloud tops ranged from 15,379 to 30,633 miles (24,749 to 49,299 kilometers) when the spacecraft snapped the images, NASA officials said in a statement. The Juno mission team encourages anyone to do such processing work with the spacecraft's photos. You can try your hand at missionjuno.swri.edu/junocam. The Great Red Spot is about 10,150 miles (16,330 km) across — roughly 1.3 times wider than Earth. But the monster storm used to be much bigger. For example, records suggest that it spanned about 35,000 miles (56,300 km) in the 1800s. 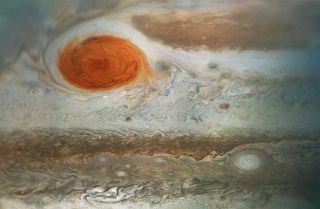 If the shrinkage continues unabated, the Great Red Spot could disappear entirely within a few decades, some astronomers have said. The $1.1 billion Juno mission launched in August 2011 and arrived at Jupiter on July 4, 2016. The spacecraft orbits the gas giant once every 53.5 Earth days on a highly elliptical path, making scientific observations during close passes such as the April 1 encounter. During these flybys, Juno maps Jupiter's gravitational and magnetic fields and studies the composition, temperature and movement of the planet's thick atmosphere. Such data are helping scientists better understand Jupiter's interior structure, as well as its evolutionary history — how the giant planet took shape and has changed over time.